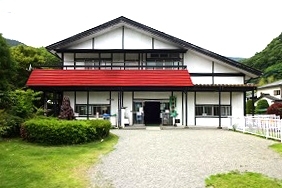 It is located close to bus stop "Yadoriki". Sight seeing info is available here for Yadoriki area with pamphlets and others. Reservation for tennis courts and athletic field is possible here. Overnight stay is also available. Fresh vegetables harvested directly from the field is also available. Closed Monday afternoons, Tuesdays, following days of after national holidays, from Dec. 28 through Jan. 3. Room charge 4,000 JPY / night for minimum 3 persons. Additional 2,800 JPY for dinner and breakfast per person.